This story is about five people swept up by a revolution. This revolution – roiling, turning – took place in the dying months of 1917, bursting forth from a cold city named Saint Petersburg. This story is also about five people remembering those (terrifying, joyful) events and sharing their memories with an audience. 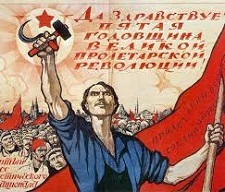 As did so many other Soviet citizens in the 1920s, they have taken to the stage – untrained but eager. On Mighty Wheels’ is a freeform tabletop game about five people – a family – retelling the Russian Revolution. It opens with the final moments of the story before stepping back in time to follow the characters, and discover the path that brought them to that point. You might enjoy this game if you like social drama, difficult decisions, and emotional, character-driven games.